Back in the 1980s and even into the 1990s, American animated cinema was almost exclusively Disney, with only a handful of smaller features here and there. During this time, however, was one consistent alternative in the form of the films of Don Bluth, which became great successes in their own right. Oftentimes, Don Bluth’s films rivaled – and sometimes surpassed – the success of Disney’s features of the time. Today, Don Bluth’s films hold a strong nostalgic value for many, and among the directors most famous features is An American Tail. On the downside of things, Don Bluth’s movies do not possess the same timeless qualities as the Disney features, and American Tail is no exception. 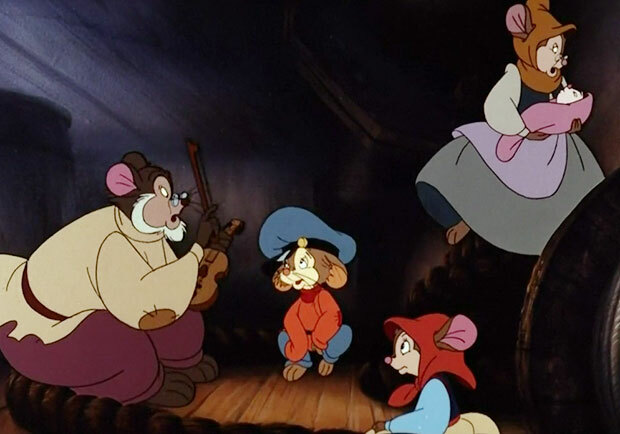 An American Tail tells the story of the Mousekewitzes, a family of Russian-Jewish mice who plan to immigrate to America after their home is destroyed in an arson attack by the Cossacks and their cats (“there are no cats in America” say the immigrant mice, apparently unaware that they’re the second most-popular pet in the country). Tragedy strikes aboard the boat to America, however, as the Mousekewitz’s young son, Fievel, ends up going overboard during a terrible storm. Fievel manages to survive, but is orphaned from his family. Unbeknownst to both parties, they both find their way to New York City, with Fievel’s sister still believing him to be alive, despite her parents’ losing hope, and little Fievel trying to reunite with his family. All this while trying to avoid the cats that lurk the streets of New York. Let’s stop and think about this for a moment. This is a movie intended for young kids, and within the first few minutes, we have a family’s house being burned to the ground, a kid being orphaned while his family believes him to be dead, and they’re all trying to avoid being eaten. Geez, what a downer. I certainly have nothing against sadness being present in children’s films, especially since the best such films are those that don’t talk down to their target audience and show children that, sometimes, the world is dark and scary and sad. But An American Tail just feels like it’s stacking tragedy after tragedy on top of each other to manipulate pathos from the audience. Another issue with An American Tail is that there’s really nothing to its characters. Sure, Fievel is cute and all, but that’s about all there is to say about him. And many of the side characters, like the villainous Warren T. Rat (a cat in disguise as a rat) and Tony Toponi (a streetwise mouse who befriends Fievel) are either completely forgettable or just come off as annoying. One of the few exceptions is Tiger, a kindly fat cat who speaks in the voice of Dom DeLuise who serves as the film’s (much needed) comic relief. Sure, some would argue that An American Tail is a children’s film, and that you shouldn’t expect more fleshed-out characters, but that kind of argument seems like a defeatist cop-out. There are plenty of children’s films that have enough confidence in their target audience to understand deeper characterization. It’s true that many animated films of the 1980s had a similar approach, and were incredibly simplistic. But just because this issue wasn’t exclusive to An American Tail doesn’t take away its accountability for it. The sad thing is, this seems to be a recurring issue when revisiting Don Bluth movies. Bluth may have made a number of films that many of us look back on fondly, but their lack of depth and substance only becomes apparent with age. Bluth definitely understood how to direct the animators in creating the visuals for his films, as they tend to be on par with Disney’s animated features of the time in regards to visuals. But Don Bluth’s films don’t seem to understand how to develop characters, and instead just throw a bunch of sad events around cookie cutter characters in an attempt to make us care. I know, I’m now the villain of many an 80s and 90s kid. Though being born in 1989, I fit right into this same crowd. I myself grew up watching An American Tail, and have many fond memories of it. But An American Tail, like a number of Don Bluth’s other features, seems as underdeveloped in story and characters as it is pretty to look at. I’m afraid nostalgia can’t improve storytelling. An American Tail is not a bad movie. It’s just a generic and uneventful one. The animation is well made, with the characters moving fluidly and the scenery boasting many intricate details. But the story and characters lack substance (made all the more notable by how the film quickly chickens out of the tragic Jewish parable it hints at in the opening). While I’m a proud US citizen and can greatly appreciate the film’s sense of American optimism, that can’t make up for the pandering sentiment. The songs aren’t particularly memorable, either. 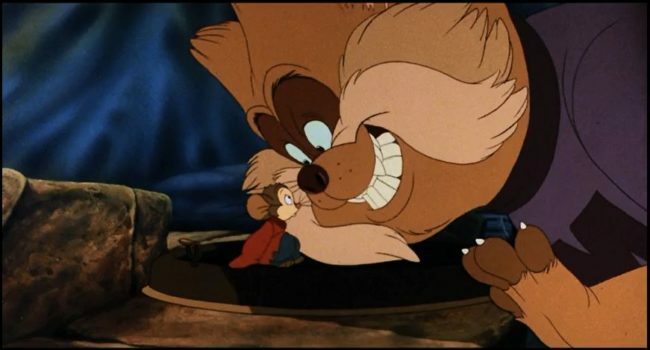 Again, An American Tail could be a whole lot worse. But for a film that so many people swear to be “better than Disney,” there’s really not a whole lot to it. It may be a nostalgic treat for many. Though aside from the animation itself, that might be all it is. Me as well! I watched this a lot when I was younger! Ahh sweet, sweet nostalgia.